Build Network Marketing Leaders Faster! Much Faster! 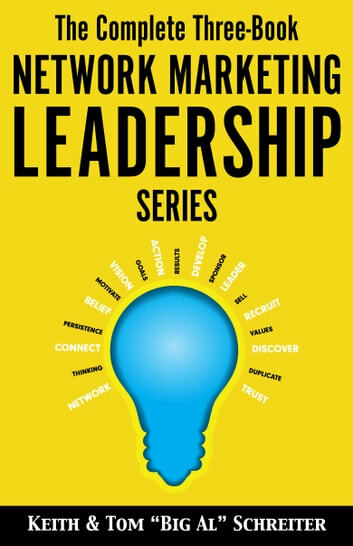 Entire three-book leadership series by Tom "Big Al" Schreiter and Keith Schreiter. Book #1: How To Build Network Marketing Leaders Volume One: Step-by-Step Creation of MLM Professionals shows us how to locate the best leader candidates and how to groom them for leadership. Learn exactly what to say and exactly what to do to change their attitudes, their thinking, and their results. Why? Because leaders are everything in network marketing. These are the long-term producers that leverage our income. We have limited time. We can only work with a limited number of distributors. So, we must duplicate ourselves through our leaders. Everyone says they want to have more leaders, but how? How does one find leaders? How does one create leaders? What are the things we need to teach ordinary distributors to do in order to for them become leaders? This plan doesn’t happen by accident. Discover how to give ordinary distributors a leadership test to determine if they are ready to enter the path of leadership. 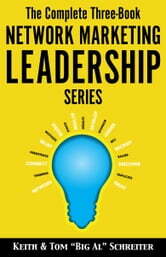 Then, learn how to start their learning process with the biggest leadership lesson of all: problems. Book #2: How To Build Network Marketing Leaders Volume Two: Activities and Lessons for MLM Leaders takes our potential leaders and expands on what they can do to grow their teams faster. No one is a "natural-born leader." Babies aren't given a manual on how to be an adult. Adulthood is learned from others. Yes, they could imitate us to become leaders, but not everyone is created the same, with the same set of skills or advantages. So, there must be common lessons everyone can learn for leadership. Inside this book, you will find many ways to change people's viewpoints, to change their beliefs, and to reprogram their actions. And when these three things change, the results will naturally change too. Book #3: Motivation. Action. Results. How Network Marketing Leaders Move Their Teams adds another 172 pages of step-by-step actions and campaigns to make our leaders the best they can be. Getting results from the team is the measurement of true leadership. Our new distributors need motivation to overcome the negativity of their initial prospects. Our experienced distributors need motivation when they run out of prospects to talk to. Put your team into momentum. Order The Complete Three-Volume Network Marketing Leadership Series now! ...And the Clients Went Wild!